Companies importing containers into Norfolk are being advised to "be very aware" of unexpected cargo following a spate of deadly black widow spiders arriving in the county. The latest cluster was discovered at Fendercare Marine, Seething, inside a shipment of tyres from Arizona. More were found last November and December. 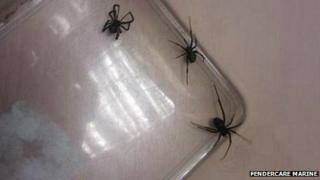 A spokesman said there was "no further risk" of spiders in their building. Pest controller Jon Blake said the reason for the increase was "unknown". Mr Blake, from Abate Pest Management near Norwich, said: "We've certainly had to become more knowledgeable about the spiders and read up on their habits and lifestyle. "As to why we're suddenly getting so many at the moment is a bit unknown. "It might simply be that people are just becoming more aware about what they look like. It wouldn't surprise me if there have been loads of other cases across the country, but people just haven't reported them." The female black widow spider is about 1.5in (38mm) long and can live up to three years in the wild. The females are classed as one of the most venomous spiders, although their bites are not usually fatal for humans because they only inject a small amount of venom. Mark Cook from Fendercare, a company that works in the marine, defence and renewable energy industries, said it was an "unfortunate scenario" that was hard to regulate. "In the Arizona desert it is very difficult to control because you have to leave the door open when filling the containers," said Mr Cook. "They can crawl in and find somewhere warm to sleep, and the next thing they know they wake up in the rather chillier climes of Norfolk. "After the last incident [in December] we made staff aware of what to do." Mr Blake said his company had been advising firms handling container imports to take precautions. "We've been advising staff dealing with container goods to make sure they are wearing gloves," he said. "The spiders will only bite if they feel threatened, so when perhaps you're about to put your hand on one. "If you have gloves on they physically can't bite through them. It's a case of people bringing in imports to be very aware of what else is in the container."